Android continues to hold court over the rest of the mobile industry in almost every global market, according to a new report from Kantar Research. The data shows that devices running the Google-owned operating system accounted for at least 50 percent or more of sales in the US, Europe, Latin America, Australia and China during the final three months of 2013. In some regions, Android’s share of sales is over 75 percent, and it posted annual gains in each market that Kantar measured. The research firm found that Android retook the top spot in the US market, to account for an estimated 50.6 percent of smartphone sales between October and December 2013. 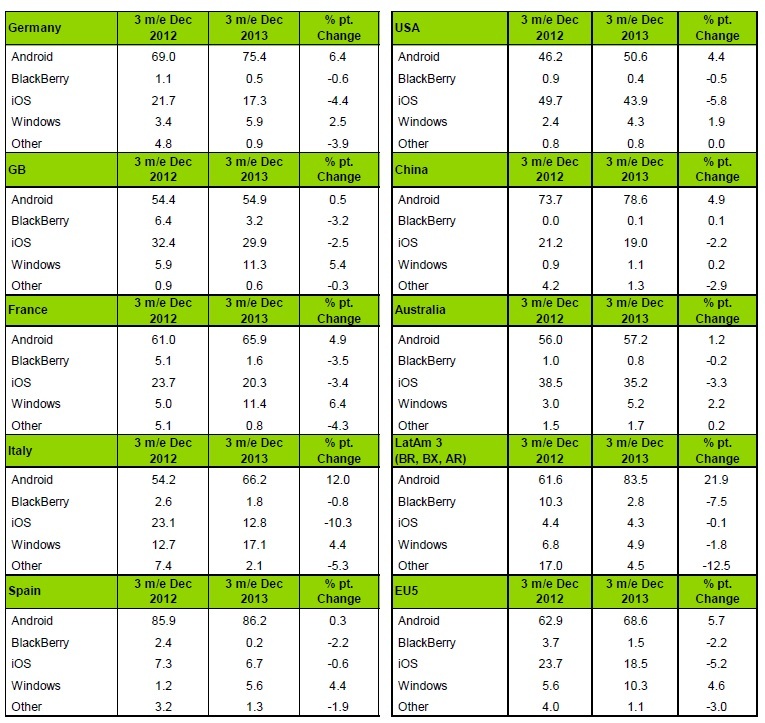 That’s just ahead of iOS (43.9 percent), while Windows Phone languishes some way behind in third (4.3 percent). The three platforms rank in the same order across Europe, although the margins differ considerably. Android holds a dominant 68.6 percent share of sales across — the five biggest European markets — UK, Germany, France, Italy and Spain — while iOS picks up second place with 18.5 percent and Windows Phone accounts for 10.3 percent. Those figures are based on averages across Europe, and vary from market to market. Windows Phone is, for example, ahead of iOS in Italy (where it holds 17.1 percent market share compared to Apple’s 12.8 percent), although that is the only market where the order of the top three is different. Windows Phone also holds second place in Latin America, according to Kantar. Though it represented a mere 4.9 percent of sales during the three-month period, that is more than iOS (4.3 percent.) As is the case in Europe, Android dominates Latin America by a long stretch, holding an estimated 83.5 percent of sales. Finally, in China, the picture is a little different. Android leads the field — as it has done for some while — and accounts for 78.6 percent, an increase of 4.9 percent over the past year. iOS is the second most popular platform with 19 percent (though that is down 2.2 percent on the previous year), while Windows Phone limps in with 1.1 percent — that’s actually less than the ‘other’ devices category that is not broken out by Kantar. BlackBerry continues to struggle worldwide. Market share is down in the US, Europe and Latin America, and it accounts for a negligible section of the market in each region — as you can see from the charts below. Reflecting on the data, Kantar’s Dominic Sunnebo explains that Apple has retained a strong presence in key markets despite its share of sales dropping over the past year. Windows Phone has now held double digit share across Europe for three consecutive months. Unfortunately for Nokia the European smartphone market is only growing at 3% year on year so success in this market has not been enough to turn around its fortunes – reflected in its recent disappointing results. Its performance also deteriorated toward the end of 2013 in the important growth markets of China, USA and Latin America. Interestingly, Sunnebo has words of warning for Samsung, which he believes is “now coming under real pressure in most regions.” Though Kantar’s data is based on operating systems, the company says Samsung’s market share is down 2.2 percent to 40.3 percent in Europe, while its share of the Chinese market remained flat at 24 percent.